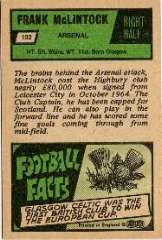 A&BC Chewing Gum produced some of the most attractive and high quality football cards in the period from 1954 until they were taken over by Topps in 1975. 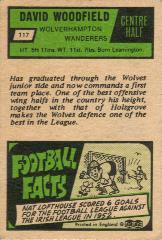 However, during this period they also produced some variant and error cards, which have now become collectable in their own right. 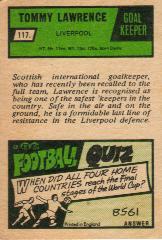 This page highlights the A&BC variant and error cards from their English productions (remembering that A&BC also produced Scottish sets). If you know of any others, or can add extra information to this page, please send an email to this email link. The reasons for the existence of variant and error cards is not always evident. Some can be explained away by simple human error in the production process, while others seem to defy logic. If you have knowledge, or even a theory, of why these cards exist please feel free to contact this site. I do not claim to have discovered these variants or errors. 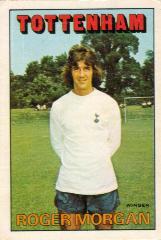 Most of them have been documented since the cards themselves were first issued. 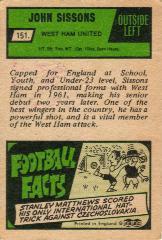 I'm aware of two variations in the 1958/59 set of 92 cards. 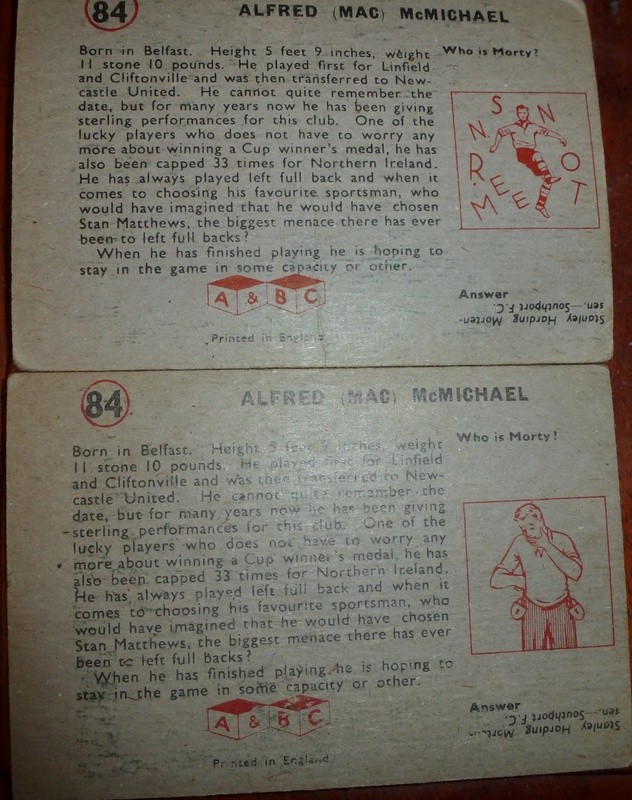 Each card has a quiz and a cartoon on the back, but cards 83 and 84 are known with two different cartoons. 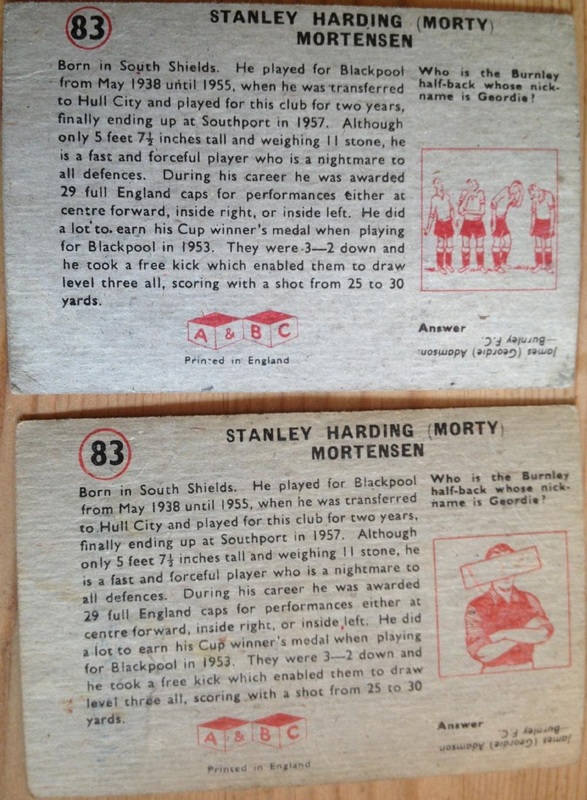 For card 84, Stan Mortensen is the answer to the quiz, so the cartoon with his surname jumbled is considered the 'correct' card. 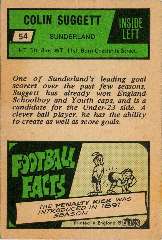 For card 83 Jerry advises that the player with his eyes covered is probably the correct cartoon answer to the question 'Who is the Burnley half-back whose nickname is Geordie', since the other cartoon is printed on another card with an appropriate question. 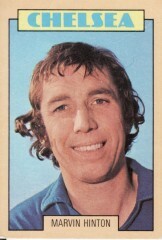 Some of the cards in this set have a picture of a football on the front, next to the team name, while others do not. This is considered a variation, rather than an error. 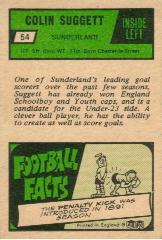 Perhaps the cards were produced in two lots, with the football forgotten from one of the lots. The two cards shown have been randomly selected to show this feature. The cards which do not have the football are numbers 2, 12, 19, 25, 32, 40, 44, 47, 48, 63, 65, 77, 78, 79, 82, 83, 86, 87, 88, 89, 91, 92, 93, 95, 96, 100 and 101. 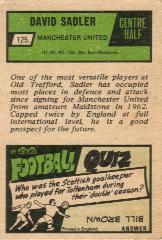 Card number 71, Joe Baker, is known with both a football and a non-football version. 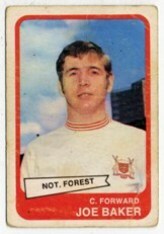 The version without the football is rarer, is therefore considered the error card. Card numbers 6 and 48 appear to have their card numbers printed in a smaller font than all other cards in the set (see pictures). There is not an obvious explanation for this. 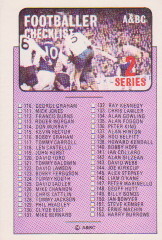 Green back cards from Series 1 and 2 (numbers 1 to 117) have a card number on the rear without a full-stop, with the exception of cards 85 and 95, which have small full-stops. Cards from Series 3 all have a full-stop after the number. There are two cards in this set with number 117. 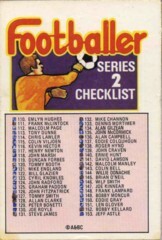 The David Woodfield card does not have the full-stop after the card number, and is included on the Series 2 checklist. This card is therefore accepted as being part of Series 2. 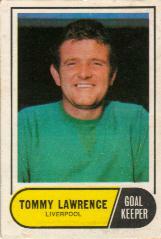 The Tommy Lawrence card does include the full-stop, and is included on the Series 3 checklist, and is therefore accepted as being part of Series 3. This means that the green back set has a high card number of 170, but includes 171 cards plus three checklists. 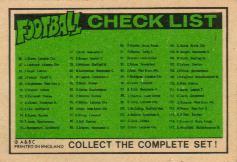 The 2nd series checklist begins a sequence of variations in A&BC Gum checklists lasting until 1973/74! It appears as if A&BC Gum produced an early or trial version, and then updated it closer to the actual production run of the cards, often making last minute changes. 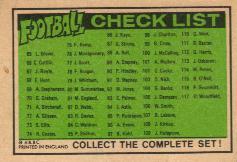 A number of cards mentioned on the checklists may therefore never have been produced. 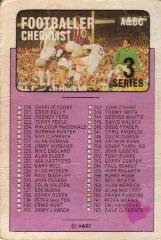 For the Green backs the 2nd series checklist reflects a change in style from Series 1, where the player name and team was printed, to the Series 3, where only the player name appears. 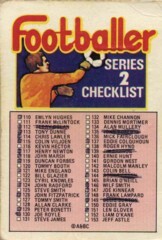 One version of the Series 2 checklist includes the team name (the 4-column version), while the other doesn't (the 5-column version). Perhaps surprisingly the more accurate checklist of the two does not include the team names. 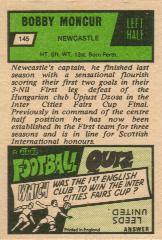 To the best of my knowledge the three cards in the table above from the 4-column version were never produced. 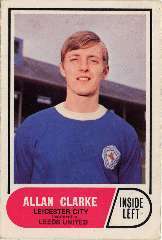 Allan Clarke was transferred from Leicester City to Leeds United in June 1969 in a high profile, £165,000, transfer. 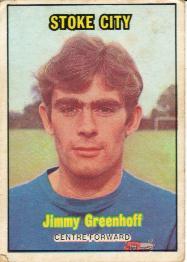 It is likely that this transfer coincided with the production run of the Green backs in time for the 1969/70 season. 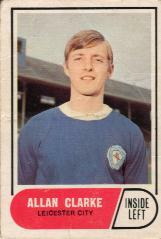 In order to ensure that they captured the event A&BC produced a second version of the Allan Clarke card with the text 'Transferred to Leeds United' on the front. There was no change made to the back of the card. 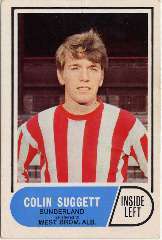 Colin Suggett was transferred from Sunderland to W.B.A. 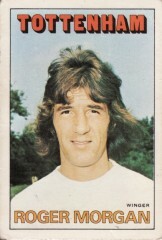 in July 1969. 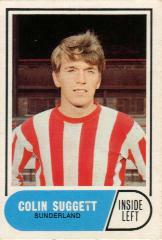 A&BC reflected this transfer through a second version of this card with the text 'Transferred to West Brom. Alb.' on the front. There was no change made to the back of the card. 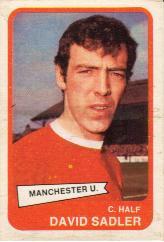 David Sadler played for Manchester United from 1963 until 1973. Although he was not transferred within the timeframe of the A&BC print run there are two completely different versions of this card. The two cards have different front pictures, and different text on the rear. 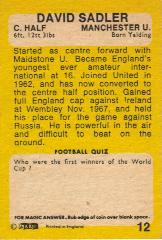 One of the cards has the full-stop after the card number, and uses the same image from the 1968/69 Yellow backs (though resized and reversed, an old trick, see pictures). 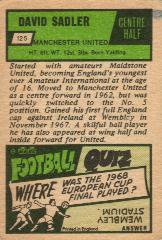 However, the green back text is quite different and his place of birth has been changed, from Yalding to Maidstone. 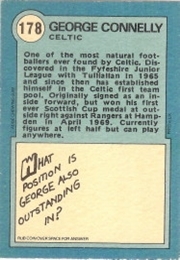 The other green back card has no full-stop after the number, has the same place of birth as the yellow back card, and a similar (though different) biography. 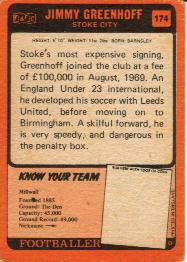 This card tends to be rarer than the 'full-stop' green card. It is not clear which of these two cards came first. 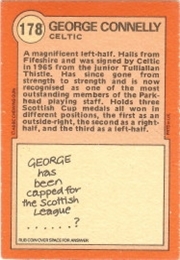 The 'full-stop' card suggests that it was part of the original Series 3 run. The fact that it uses the same image as the previous year's yellow backs also suggests that they were struggling with their Sadler card. 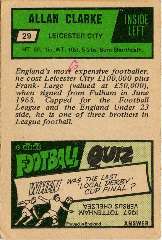 Perhaps it was replaced when the new image became available, although if this were the case why would they change the place of birth, biography and Football Quiz? There appears to be no reason for this reprint. The photo stays the same (though is resized) and the text is changed. 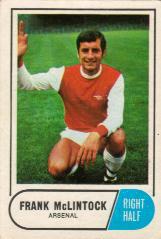 The original card starts "Arsenal's captain,...", while the newer version starts "The brains behind...". 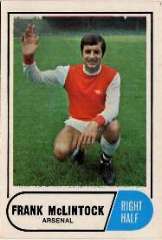 One possibility is that A&BC mixed up the Scottish Blue back set, which includes the larger photo and text which begins "Arsenal's captain". 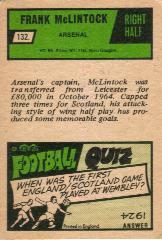 Interestingly, and wrongly, the Scottish card lists McLintock as a centre-forward! 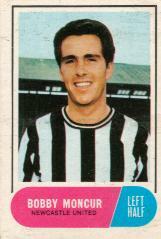 Two versions exist of the Bobby Moncur card. The pictures are similar, though different. 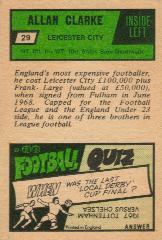 The text on the rear of the cards is the same, though one has 'Football Facts' and the other a 'Football Quiz'. 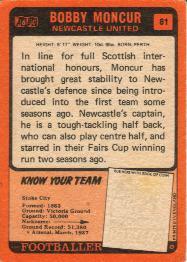 The original Series 3 card has the team name 'Newcastle United' printed on the front and rear, as does every other Newcastle card in the set (view here). 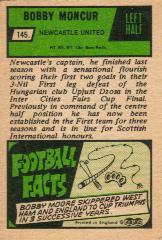 However, the apparently 'newer' version has the team name 'Newcastle'. Does this mean that a new error was introduced in the reprint? 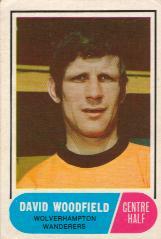 To add further to the confusion, the image used on the original, 'full-stop' version of the card is the same as used for the following year's orange back series (see picture). 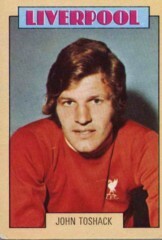 Brian O'Neil was signed by Southampton from Burnley for £75,000 in the summer of 1970, just about the time A&BC would have been preparing and printing the cards for the Orange back series. 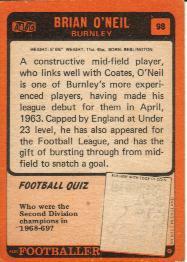 In response to this A&BC coloured in his shirt (you can tell this as there is a player in Burnley colours in the background) and changed the team name on the front of the card, but apparently forgot to change the team name or text on the back. 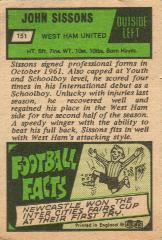 In a later reprint they changed the team name and rewrote the player biography. 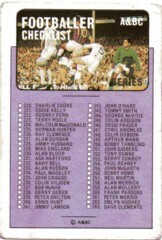 The 2nd Series checklist, card number 85, has cards listed wrongly in the sequence 144 to 160. 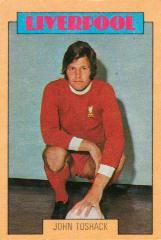 The checklist has Terry Alcock as 144, through to Neil Young as 160. 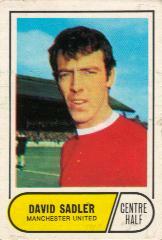 John Angus is actually card 144, and Alcock is card 145. All of the cards listed in the checklist from 144 to 159 are numbered +1 on the actual cards e.g. 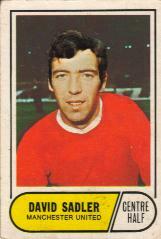 Peter Dobing is 155 on the checklist but is card number 156. 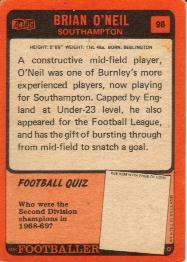 Neil Young appears on card 218 (not 160), and is correctly listed as 218 on the 3rd Series checklist. So, in summary, there is a numbering error on the 2rd Series checklist where these numbers do not match the actual card numbers. 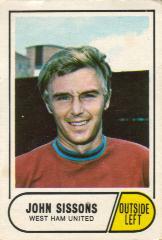 The Checklist has card 169 as David Tayne, whereas it should be David Payne. 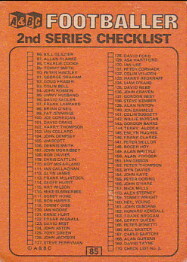 The Series 3 checklist card comes in two varieties. The first references cards to 255, the other to 256. 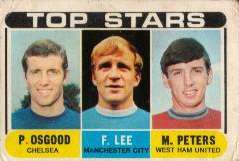 There are differences in the players listed on the cards, summarised in the table below. 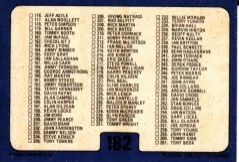 The cards listed on the 255 version e.g. 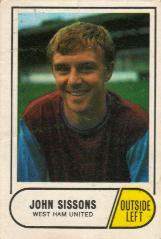 Hill, Barnard, Howe etc. are not known to exist. At the bottom of the 255 version is printed 'Subject to change'. Card 256 (Checklist) is not known to exist. The John O'Rourke / Jimmy Greenhoff error is one of the more obvious A&BC ever made by simply mixing up the photos of the two players. Click to see the Tony Coakley letter explaining this variant. The letter states 'this mistake was spotted and immediately the printers corrected it, but unfortunately a certain amount of cards were manufactured and released into the shops'. In a later reprint A&BC corrected the photos. 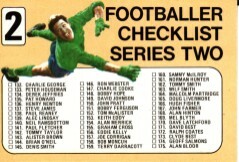 This Series 2 checklist is an amazingly inaccurate reference. What was going on at A&BC? Did they allocate this task to the work experience boy? 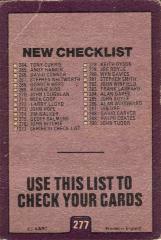 The checklist covers cards from 110 to 153 on the front, and then 154 to 219 on the back, plus it lists 302 as the Series 3 checklist? 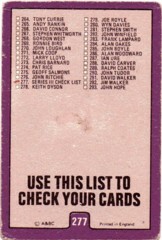 Series 3 only ran to 290 cards (though A&BC may not have designed it by the time they were producing Series 2), and the checklist ended up being card 277 (see entry below). The many differences between the checklist and the actual cards are listed below. 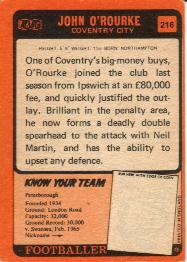 To the best of my knowledge the errors on this card were never corrected by a reprint. The purple back series numbers up to 290. 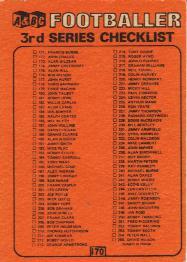 However, A&BC produced a Series 3 checklist which numbered up to 293. It appears that they produced the 293 checklist first, then realised the error (or changed their mind about how many they were going to produce), and so issued a new checklist (labelled 'New Checklist!)'. 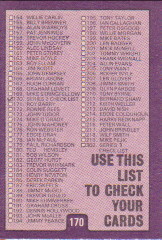 The Footballer Stamp Album , issued to store the Club crests and Superstar stamps has a 'complete checklist' of the Purple Back set on the back cover. There are some interesting anomalies between this checklist and the actual cards. Two versions of this checklist exist, one numbering up to 218 and another numbering up to 219. 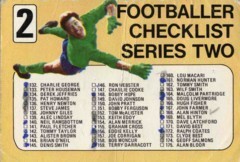 The 219 version checklist is the later edition (it has the words 'Revised checklist' on the back), including players from the promoted clubs from 1971/72 (Norwich and Birmingham) and removing some players from the relegated clubs (Nottingham Forest and Huddersfield Town). 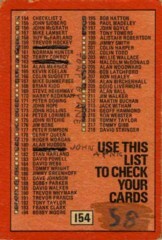 The updated checklist also has the spelling corrected on card 204 from Malcolm McDonald to Malcolm MacDonald, and card 213 Jack Witham corrected to Whitham. 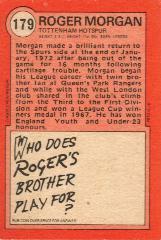 There are two versions of the Roger Morgan card, though it is not clear why. One shows his head and shoulders only, while the other shows the head and torso. The backs of the two cards are identical. For the only known time A&BC produced a set with two different coloured backs. 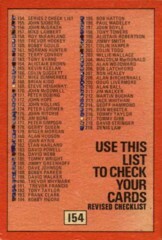 Series 1 (cards 1 to 89) had blue backs, while Series 2 (90 to 179) had orange/red backs. 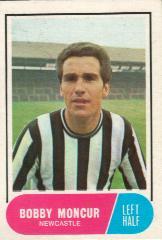 However, card number 178 is known with both coloured backs. Two versions of this checklist exist, one numbered to 264 and the other to 261. The '261 version' is the later, and therefore more accurate version though it is still not an accurate checklist for the actual set. 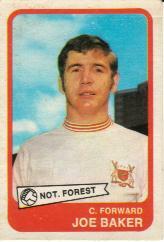 Cards 262 (George Armstrong) and 264 (Billy Ingham) from the '264 version' were never produced. 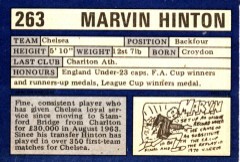 The Marvin Hinton card is numbered 263, so there is no card number 235 in the set. 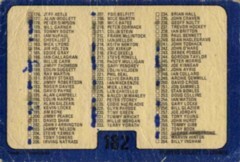 The cards in the table below from the '264 version' e.g. Giles, Macari, Holton etc. are not known to exist. 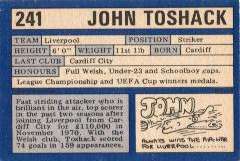 In a remarkable coincidence with the previous set, one card (John Toshack) has two versions, a full body shot and a head and shoulders only shot. The two cards have different text and cartoons on the back. 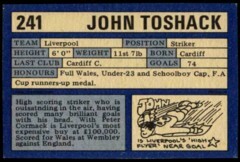 Interestingly, the 'head and shoulders' card has a section 'Goals', which appears on the rear of the 1st series cards but not the 2nd series cards, suggesting that the Toshack head and shoulders card was originally intended as a Series 1 card.